We include this stem in our Buyers Guide, for riders, who may have developed back difficulties, since they first bought their bike. In our store we have found women particularly have an interest in this stem. The Nitto Technomic model we sell, has a only a 60mm extension, but a very tall quill. The quill on this stem is distinctive, it's 200mm long and has a useful height of 145mm between the maximum height line and the center of the extension. Nearly every other stem we sell has a useful height of between 20 and 45 millimeters, so if you want to avoid bending over deeply on your bike, changing to this considerably taller stem is recommended. The Technomic is made from two parts of light aluminum alloy. The head is cast as a single piece with the quill tubing section as a separate piece of aluminum tubing. The wall thickness of the quill tubing is 3.7mm, and is 177mm long, with the diagonal wedge cut at the bottom. The pieces are joined by a hot pressure system, in the way several seatposts are. The head for the quill is drilled through for the expander bolt leaving a 13.5mm diameter recess for the bolt head to sit into. The binder is fashioned as stems have been historically, with an exposed hex head bolt at the front. The handlebar hole, after casting, is honed to a precise 25.4mm inner diameter to fit nearly all handlebars. The gap that permits the stem to cinch the handlebar is cast into the binder rather than being cut away from it in manufacture. The front of the binder is drilled for the bolt, including a recess for the bolt head to mount flush to the face. 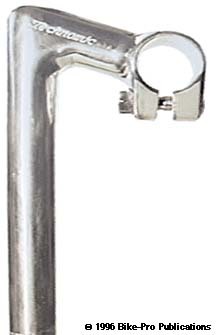 The binder bolt threads into a chrome plated steel six sided nut at the back of the binder. 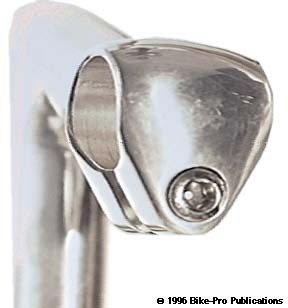 The binder bolt is made of chrome plated steel, has a 6mm hex head that has a 11.7mm outer diameter, with 8mm threads by 1.25mm thread pitch. It is 30mm long, and to avoid direct bolt to stem friction on tightening has a small steel washer that the head rotates against. The binder bolt, washer and steel nut weigh 19 grams.